"Exile and Nostalgia: Andalusi Identity in the Maghrib" presented at “Mediterranean Migrations” The Mediterranean Seminar 2018 Spring Workshop. “How Are We Supposed to Know One Another? Communal Refashioning in Francisco Nuñez Muley’s Memorandum”, presented at “Passages” Early Modern Iberia Study Group Symposium, University of Pennsylvania, Philadelphia, PA, April 2017. “Cartography as Kingmaking: Muslims Scholars in the Norman Court of Sicily” presented at 66th annual New York State Association of European Historian’s Conference. St. John Fischer College, Rochester, NY, October 2015. “The Political Context of Sufism in Sixth/Twelfth Century al-Andalus” presented at Scholar’s Day, SUNY College at Brockport, Brockport, NY. April 2015. HIS 193 Marco Polo and Other Medieval Adventurers, University of Rochester, Instructor. 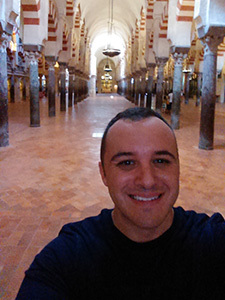 HIS 192 Al-Andalus: Journeys Through Muslim Spain, University of Rochester, Instructor. HIS 126 Hitler's Germany, 1914-1945, University of Rochester, Teaching Assistant. HST 130 Ancient and Medieval World Survey, SUNY College at Brockport, Teaching Assistant.